The Great Australasian Beer Spectapular – the best run festival ever. 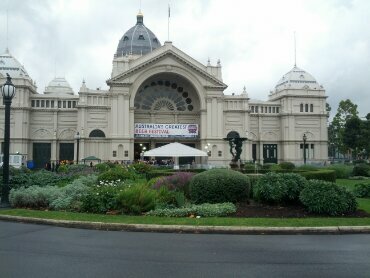 Yeah, like beer geeks around the country, I was in Melbourne for Good Beer Week. In fact, if you’d dropped a bomb on Melbourne last week, you’d have likely obliterated a huge portion of the beer geek population. Good news for those who want to drink a beer in peace without being told what hops it contains but terrible news for the Speigelau sales figures (they’d have to rebrand that IPA glass – ‘‘the new water glass, it amplifies the smell of added fluoride’’). Anyway, here is a handful of great things about the three days I got to spend enjoying Good Beer Week. Watermelon Warhead – Oh yeah! Can you tell I’m still excited? Cause I am. I’d spent the past two years reading about lucky beer geeks talk about how often they got to try this beer. All the while thinking ‘‘I’m never going to get the chance’’. So it became a white whale for me. But there it was – at GABS. And there I was – at GABS too. So, after a run to the token booth I headed straight for the Feral stall and bought me a whole glass of Warhead. Did it live up to my expectations? No, but that’s only because I’d built up my expectations stupidly high. This beer could have been brewed by Jesus and his 12 disciples could have each added an ingredient (presumably Judas’ would make it taste bitter) and it still wouldn’t have lived up to my expectations. So let me make this clear – it is my fault, not the beer’s that it didn’t live up to my expectations. What it is is a frigging tasty, refreshing beer. And one I went back later to buy another glass of – I didn’t do that with any other beer at the festival. Hopefully they bottle this soon – otherwise I might have to write another one of those open letters. Part of the fun of having a big beer week that draws people from all over the country – and other countries too – is that you get the chance to meet in person the people whose blogs you read or who you follow on Twitter. On my first Good Beer Week stop – Brother Burger in Fitzroy – I met up with Pia from Girl + Beer and Liam and Ammo from Drunken Speculation for the first time. And later Darren from 250 Beers rocked up too. I had a great time chatting, drinking Queensland beers (it was that state’s Pint of Origin venue) and eating burgers (by Christ, the Royal Blue burger is tasty). So much so that I was disappointed that I had to leave to meet a friend at another venue. The next day at GABS – as well as spending some paddle-tasting time with Liam and Ammo – I had a nice long chat with Matt from Brews News (who actually invited me to have a beer with him, which was cool) and bumped into Phil Cook from the Beer Diary blog and podcast, who was also very down to earth. And they also let me in on their secret spot to pass the time at GABS. I’m keeping it a secret – because I plan to use it again next year. I had a great time meeting bloggers whose work I read – I can only hope I left them with as good an impression. Even though the organisers had substantially enlarged the marketplace, where breweries could have their own stalls, it felt like there was so much more space this year than last year. I was there for both sessions on Friday and I never had to queue up for a beer, never had to push through a crowd, never had to struggle to find a place to sit. It was lovely. Best run festival I’ve ever been to? Without a doubt. Before I went to Melbourne I’d never had a cheesesteak, by the end of the second day I’d had three of them. All at the Catfish. My God are they delicious. If you live in Melbourne and haven’t been there to have one I suggest you go there ASAP. Also, they have some nice beers too. But those cheesesteaks … My God!. If I lived in Melbourne I’d be eating them every week. When Luke from the relentlessly excellent Ale of a Time podcast heard I was heading down for Good Beer Week he invited to be a co-host on an episode. I was thoroughly chuffed to receive the invite – especially given that their other guests have been actual important people in the beer community. When Luke later heard I’d never tried Rodenbach, he and co-host Dave arranged to bring in some to drink during the podcast. Such excellent hosts. And such an excellent beer to be drinking at 10am on a Saturday after being at GABS all day the day before. I tell you, that stuff is better than Berocca. I’m not sure when the episode will air but I hope it comes close to the high standards of the others. I doubt I’ll find out for myself – not too sure I want to listen to the sound of my own voice.